Every investigation now includes potential evidence from smartphones, computers, programs in the cloud and even smart “IoT” devices. That evidence is often critical to making the case. While there is great opportunity to find firsthand evidence among the digital footprint we create in society, our law enforcement agencies and their digital forensics labs are faced with an overwhelming amount of it. This trend will only amplify. It is estimated that there will be 6.1 billion smartphones in the world by 2020(1). On top of that, the IoT market of connected devices is expected to grow to 30.7 billion devices by 2020(2). The app market is also growing exponentially. There are 5 million different apps in the Apple and Google app stores, up from 150,000 in 2008. This growth can be expected to continue in the years ahead. While these devices and applications have brought convenience, efficiency and enjoyment to our lives, they have also brought great complexity to the investigation of crime. Our customers around the world tell us they are deeply concerned by these trends. The challenge lies in the exponential growth in the volume of digital evidence and the limited number of forensics examiners to analyze and review the data. The pace and cost of hiring skilled digital forensic examiners can’t keep pace with the avalanche of digital evidence that their labs face. This has resulted in case backlogs in many digital forensics units and the potential for further victimization by criminals. We know that our partners in law enforcement are dedicated to keeping their communities and country safe. At Magnet Forensics, it’s our mission to help our customers build stronger cases by finding the most critical evidence. Through the development of advanced technology, we stand shoulder to shoulder with our law enforcement agencies to tackle the growing digital evidence challenge. This is where Tracks Inspector comes in. We’re pleased to announce that Magnet Forensics has acquired Tracks Inspector, from Tracks Inspector B.V., a company out of The Hague, Netherlands. We’ve made this acquisition because we want to help combat the growing digital evidence challenge that is straining departments and putting justice at risk. Tracks Inspector offers an intuitive, web-based solution that puts digital investigations into the hands of detectives who have knowledge of the case but aren’t necessarily digital forensics specialists. It allows investigators to conduct an early case assessment and identify the data and devices relevant to the case. This approach enables the forensic unit to focus on targeted forensic analysis. Ultimately, this workflow allows investigators to review digital evidence faster while freeing up Digital Forensic Units to work on the greatest technical challenges. Current tools developed for investigators to triage digital evidence in the field are limited. On the other hand, the complex tools used by digital forensics experts are not suitable for investigators. Tracks Inspector closes this gap, allowing investigators to solve common cases while easing backlogs in digital forensic labs. 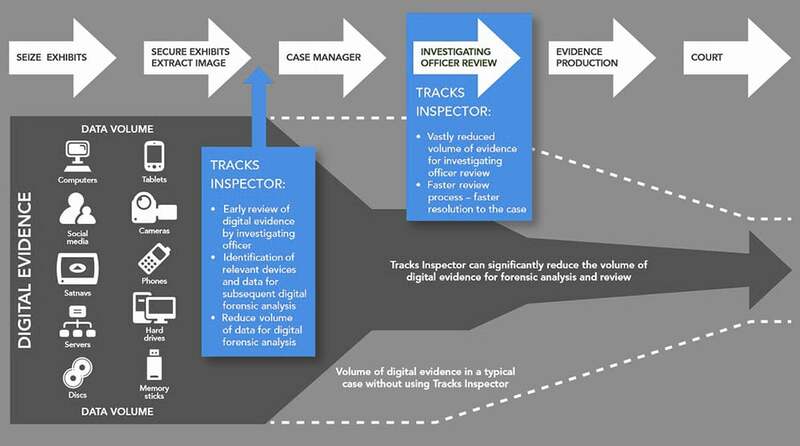 Below is an example of the workflow enabled by Tracks Inspector that gets digital evidence in the hands of an investigator earlier to start working the case. In the coming months, Tracks Inspector will join the Magnet Forensics portfolio under the name Magnet REVIEW™. Managing What Data Is Available for Review: Providing the ability to load outputs from computer, mobile & cloud forensics tools into a single platform eliminating the work of sharing multiple tool reports. Controlling what gets published for review by investigators. Working a Case with Multiple Investigators: Intuitively adding comments, tagging items, and sharing links while working together on a case to keep investigations moving. Improving collaboration between investigators and other stakeholders, reducing the time required to review the evidence. We look forward to welcoming the dedicated and experienced team from Tracks Inspector to the Magnet Forensics family. The current team will continue to work out of their office in The Hague. Soon, this dynamic space will become the Magnet Forensics corporate headquarters for Europe. In the coming months, you will also see some additional updates to Magnet REVIEW, as we work to incorporate it into the Magnet Forensics portfolio. To get a demo of the current Tracks Inspector solution and keep up to date on the addition of Magnet REVIEW, please click here. You can also read our press release here. I look forward to partnering with you on this exciting journey of modernizing policing and, in our small way, enabling your dedication to community safety.